There are so many things to love about fall... pumpkin everything, soups, thanksgiving (well, for us Canadian folks lol), Halloween and the excitement that comes along with the encroaching holiday season. My friends and I at the Blended Blog came up with the October Style Series to feature some of our favorite fall pieces. Okay, in all honesty, I had very little (read: nothing) to do with the creation of this series... I literally picked one of the looks and here we are. Also, as will be painfully obvious, I have been not organized enough to take blog-quality pics for the post. Soooooo you get iphone pics care of my husband (which seemingly automatically reduces the quality of a normal iphone pic - sorry hun, photography is not your thing)... hence the lack of focus. Now, initially I was worried because the weather here has been unseasonably warm and I picked "sweaters" but it seems as though mother nature really wanted me to get this post up because the mornings have been pretty cool lately - making a sweater necessary, at least for part of the day. As previously mentioned, I'm not organized enough to find a date/time to dress-up for the purpose of these posts so these outfits are real-live outfits I've been wearing this fall. Also, they were taken on my way out the door in the morning so we didn't have time to take a ton of pics to get the elusive perfect shot. In hindsight, probably wouldn't have taken that much more time to make Mr. B use the good camera but I digress... also, I hadn't had coffee yet... so that explains the not thinking of using the good camera and the super tired glint in my eye. 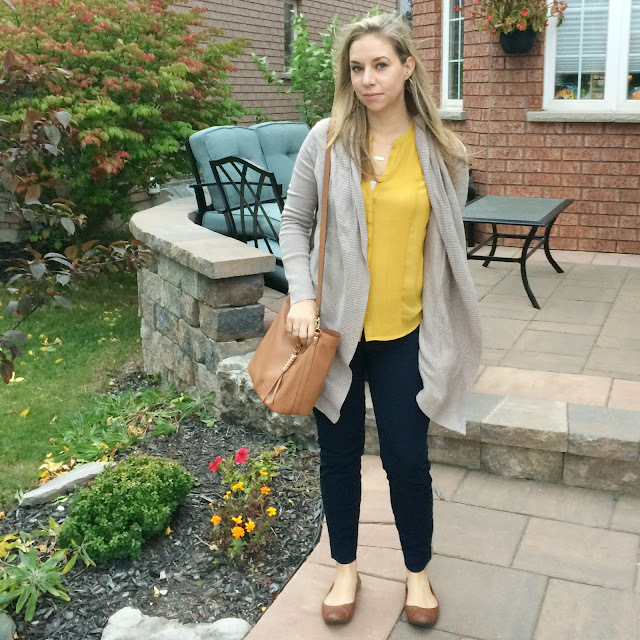 this boyfriend cardi is an oldie but a goodie. Thank YOU Old Navy for the boyfriend cardi. It's pretty much a wardrobe staple (in every color). 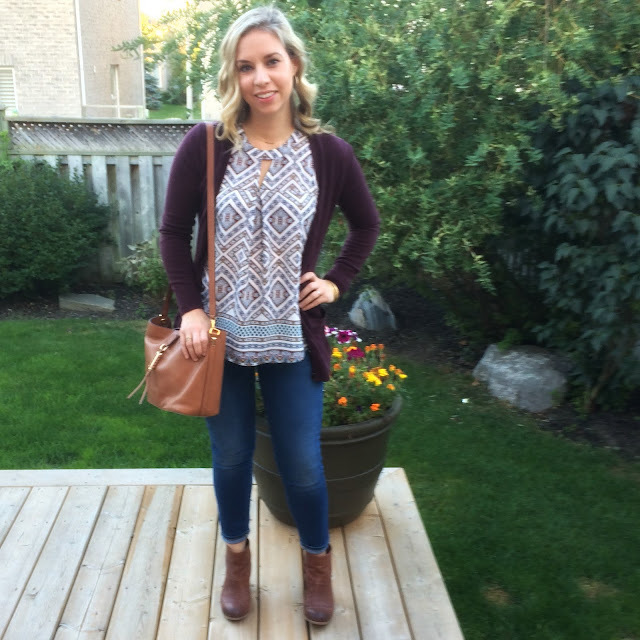 that pretty print top was an awesome Winner's find, jeans are 7 for all mankind (less budget friendly), Sam Edelman boots from last year (my FAV splurge thanks to Deena) and the bag is my new love from Stella and Dot (genuine leather Sunday bag in Saddle). So that's how I'm wearing sweaters this fall! 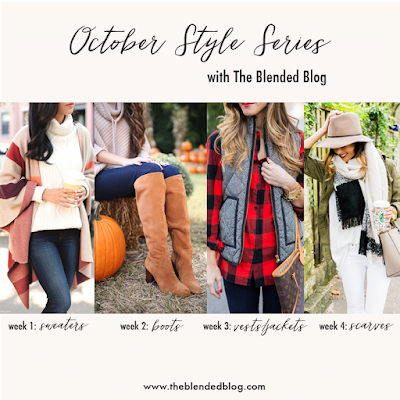 Make sure you go and visit my friend Abbie over at the Blended Blog to see how she's rocking a sweater this fall and then check out the other Blended Blog ladies and what they've been wearing. 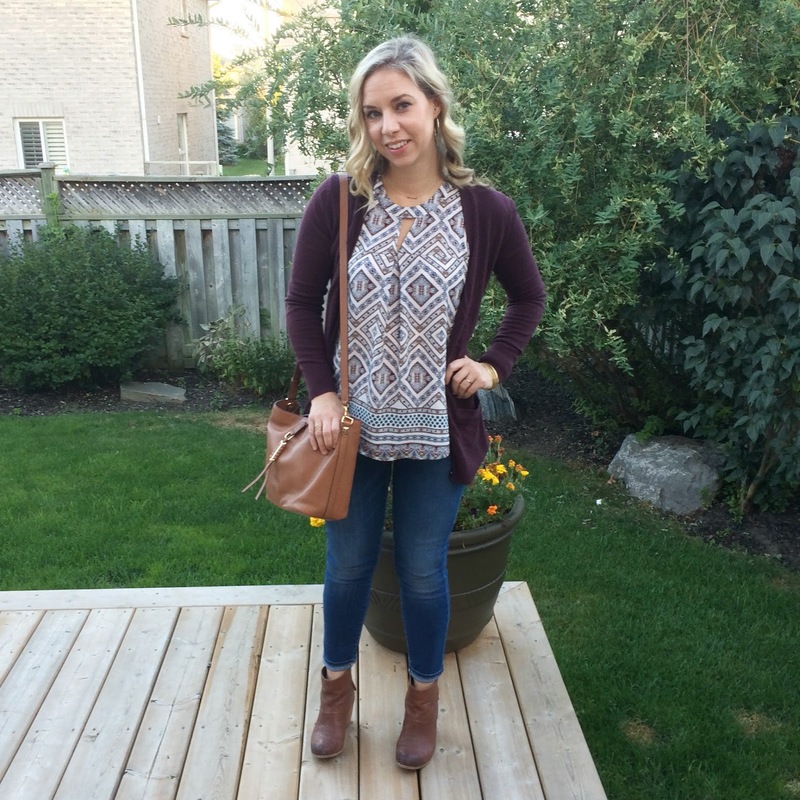 But FIRST, linkup your fall fashion post below!